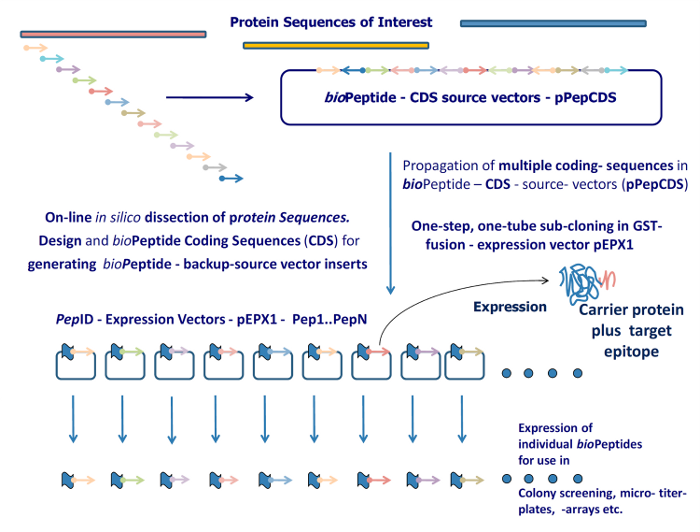 PepID combines strong computational algorithms for generating rationally designed, deterministic peptide libraries with a smart bio-based vector system for hosting and expressing DNA-encoded peptide libraries. The libraries are generally based on proteins that come from diagnostically and epidemiologically relevant bacteria and viruses, e.g flaviviruses. This makes them deterministic as the peptide sequences are based on existing and usually well-studied proteins. This sets it apart from chemically synthesized random libraries where peptide sequences are permutated without paying much attention to biological relevance. 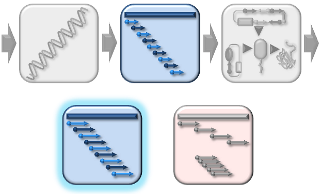 PepID separates hosting and expression into 2 subsystems. It is a bio-peptide system because the peptides are produced in a biological system, usually a bacterial host organism (but it may be any other microorganism as well), from a plasmid DNA construct. First, your protein sequence of interest is reverse translated and then partitioned into linear peptides of defined length and overlap in silico and according to your needs. Our Peptide Design Tool automatically generates the initial library design but our staff will be happy to assist you if you run into problems, e.g. 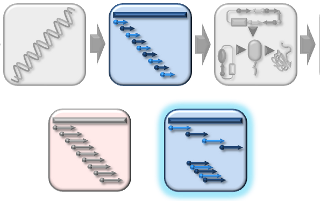 with defining the right restriction sites that are compatible with our target expression vector or figuring out the best overlap or which design best matches your research agenda. The peptide-coding DNA sequences are then assembled into a single or a set of compact constructs. These are synthesized de novo and hosted on the source / back-up vector from which they can be released whenever necessary. Peptides are released by simply cutting with a unique combination of restriction enzymes and then cloned into the expression vector. The expression vector can carry your desired/required tag, e.g. GST. This will result in a fusion peptide ready for expression testing and utilization in your application. If you wish to cover specific immunologically more relevant areas more tightly, you can adjust either the peptide length or the peptide overlap as shown in the image below. This can help you identify new linear epitopes and possibly even conformational epitopes. Varying the peptide length (A) and overlap (B) increases resolution of the epitope binning/scanning process and can help identify novel diagnostically or otherwise interesting epitopes. For a quick run-through of our system, please take a look at this animated presentation. Click on the link and open/start the presentation. It will auto-play all the way through. Please feel free to download our PepID quick sheet for an overview or a three-page article on the PepID technology. An experimental application of PepID in research on diagnostic tools for West Nile virus infection has been published by Chabierski and colleagues in PLoS ONE. This is an aspect that should be considered as the peptides need to be expressible in E.coli along with eliminating any repeats, secondary structures, and the like that impede successful synthesis of the multi-peptide constructs. Read more in the section on Optimization.